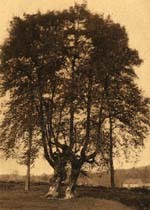 Historically, among Europeans of all Germanic (as probably in other nations), the tree and the forest held a prime position. Obviously for the wood properties as such, which has enabled to build homes, religious statuettes, vessels (such as longship), which helped keep warm, to shoes (wooden clogs), hunting (bows, spears), performing paddocks (with dead wood or hedges more or less worked), etc.. Beyond this utilitarian aspect (and life), the significance seems even greater. For example, in French Hainaut (place of Germanic settlement with the Saxons and the Franks Salian and Ripuarian), place names are quite explicit: Quesnoy (the oak), Le Quesne-to-leu (oak wolf in dialect) Fresnoy-le-Grand (black ash), Frasnoy, Aulnoye (alder), Tilloy-les-Marchiennes (lime), not to mention Preux-au-bois (bois = wood), Vendegies-au-bois, Raucourt-au-bois and many other villages reflect the importance given to forests. In this regard note that for this article the terms "wood "and "forest" will be considered synonymous, although modern times consider that the term "forest"refers to the wood exploited by man (hence apparent redundancy in some names like the "forest of Bois l'évêque). The importance of the forest among the Germanic peoples as expressed in military strategy: Arminius defeated the Romans (accustomed to training in open areas) by drawing them into a forest. The ancient Christians did not make a mistake there, such "Holy" Boniface who slaughtered in 723 a legendary oak (sacred tree of the Friesians dedicated in Donar / Thorr) to prove to the pagans that this sylvan worship was only idolatry. It is said that the present pagans expected to see the lightning coming down during the butchery of the tree; but Donar not having manifested itself, they would then convert. This story was undoubtedly embellished by the church; for my part I see the fanatical blindness of a "saint" there unable to receive the sacred in Nature and not having succeeded (nor even undoubtedly tried) to establish a link with a living being. The same goes for when Charlemagne, undoubtedly for political reasons, slaughtered the Irminsul of the Saxons in 772. It did not prevent many traditions of religious type from getting organised around the tree across ages. So some years ago, at Whitsun, during the traditional troménie of Landeleau (Finistère), a procession dedicated to St. Telo, Bishop of Quimper was sorry to see a surprising scene. "Tear off pieces of bark Oak St. Telo as a talisman, it is a pagan practice condemned by the Church", said the newly appointed prelate in the region. The bark was considered a lucky charm. We could multiply at pleasure examples. Only for entertainment, let us see as the church justifies it... On the oak of Bonnoeuvre (Loire-Atlantique), tatters are replaced with nails which the pilgrims plant in the trunk having made seven times the turn. «The nail that hit the diseased part of a person is stuck in the trunk to transfer the illness to the tree » said James Eveillard, co-authored a book on popular beliefs in France. Here is the reaction of the priest, Clarissee: « The nail is a symbol, rather revealing the mixture of belief in folk rites, as it probably refers to the nails of Christ on the Cross ». Yep, the church may even recover the "rituals" having nothing of Christian! "On the other hand, aware of the majesty of the gods, the Germans do not perceive them trapped in the walls or to represent the image of man. They spend their woods and groves and give names of deities to that mystery, that only their religion makes them see sense. " Continue with the next chapter: "They show the greatest respect for the auspices and oracles. Here is their method oracular, simple indeed. We cut a small branch of a fruit tree, it is undercut of its rejects, which some signs will allow to recognize, and they are haphazardly scattered on a white cloth.. "
In describing the cult Nerthus always a reference to a Sacred Wood, "an island of the ocean is a sacred grove, and in this timber, a tank cover, dedicated to the goddess. The priest alone has the right to touch it, he knows when the goddess is present in this sanctuary, and it dragged by hand heifers, and he follows with deep reverence. These are days of joy when it is a feast for all the places she deigns to visit and honor of his presence. " Here are some examples of the religious aspect associated with trees in the history and stories. But why this religious aspect? In what tree is considered sacred in our legends? Here are therefore some examples of the religious aspect linked in trees in history and stories. But why this religious aspect? In what is the tree considered as done bless in our legends? Yggdrasil, the "charger of the formidable". 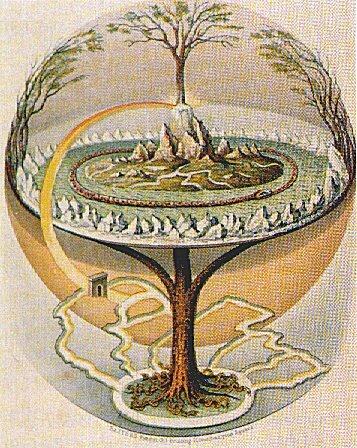 Yggdrasil is in germano-Nordic religion the pillar, the support of the world. Considered to be an Ash (very enduring tree) or an English Yew (persistent foliage; contains a toxin alkaloid which affects the central nervous system and that, correctly prepared, can be hallucinogen, as well as if a day of strong heat) is based under a yew tree, the rune Eihwaz can be linked to him: it is the vertical axis of the world, symbol of life and of death, parking balance. 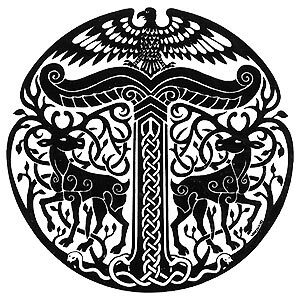 The rune is a vector of communication, and not of separation; just as Yggdrasil who links up all the worlds of the world, which is the spinal column. Yggdrasil, it is also the eternal, invincible tree, that will survive in Ragnarök, even if it «will start to tremble ». Although Nídhögg and its foliage nibbled by a hart and one goat gnaws at his roots, he always remains so resistant. Regarding this aspect of eternity, we can also mention another tree of our legends with its importance (and of the slightest): the apple tree. Indeed, the goddess Idunn (name meaning probably «the one who looks younger») is the possessor of the apples which allow to the Gods to keep their youth to Ragnarök. The theft of apples because of Loki who drew her away in a forest is a famous episode of germano-Scandinavian mythology. Yggdrasil it is also the source of knowledge. First of all because in its foot is the fountain of Mimir, wisdom and intelligence source in which Odin came to drink. In order to do that, he had to give in pledge one of the eyes. Odin will go to consult the source during the launching of Ragnarök. Then due to the fact that the pendulous of Odin for nine nights and new days was made on this tree; it is during this pendulous that Odin picked up runes by shouting and acquired an extraordinary knowledge. This tree which is «the biggest and the best of all trees» (fifteenth chapter of Gylfaginning) has therefore indirectly a role of dispenser of the knowledge in which approves sacrifices. Irminsul, the pillar of the world. It is finally necessary to name here another major tree at some Germanic people: Irminsul. Its etymology means «big, majestic, powerful, huge, «which includes the whole ». Again it was the tree backbone of the multiverse. It reminds the Tyr rune because of the design of Irminsul (the vault of heaven supported by the universal column). The axis mundi connects the earth to heaven, where once again the aspect of communication (and even transcendence) is obvious. This rune is a spiritual symbol and the world order and justice (a small link: Justice often went under a tree ...). In the 9th chapter of Gylfaginning, at the question « from where come the men who live on earth?», the Very - High (Odin) answers:« while the threads of Bor [Odin, Vili and Vé] walked along the shore of the sea, they found two trunks of trees. They raised it and manufactured two men: the first gave them breath and life, second intelligence and movement, third appearance, word, hearing and view. It also gave them clothes and names: the man was called Ask and the woman Embla. It was of them that was born the human race, which was established on lands protected by Midgard». Boyer gives a translation slightly different from that of Dillmann: «they found two stocks of trees and took them and manufactured human beings». Celane changes signification not fundamentally: it is from trees that the human beings took form and life. This fact in himself proves the major importance of these solid vegetables which take root in the earth and rise skyward. The name of first two human beings is not insignificant: Ask means "ash" and Embla "elm «. The origin of the humanity, for the germano-Scandinavian people, it is not the monkey, but the tree, enlivened by the first of the Gods. Ask and Embla: statue in the city of Sölvesborg (Sweden). What is he from Ragnarök, which is almost the end of the humanity? Does the tree play it another role? Of course! Let us take back Edda of snorri Sturlusson translated by Dillmann: both human last, Lif and Leif-Thrasir ("Lifespan" and "Long-lived" according to Boyer), «will hide in the wood of Hoddmimir, and of the dew of morning they will feed. It is of them that the men will be born». The circle is complete! 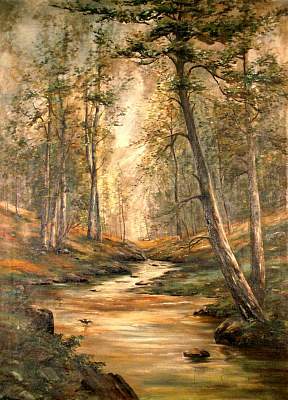 The humanity, manufactured from trees, will find its greeting in a wood (the «treasure of Mimir»).